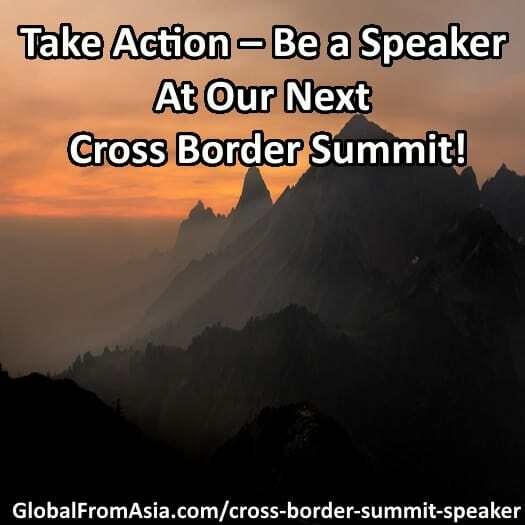 Take Action - Be a Speaker At Our Next Cross Border Summit! Take Action – Be a Speaker At Our Next Cross Border Summit! Are you an executive in a cross-border e-commerce company? Or an entrepreneur who has grown a sizable cross-border e-commerce company? We would love to consider you as a speaker for our upcoming Cross Border Summit in April 2018! We are looking for speakers who are willing to share knowledge and experience with the audience. This can be in the format of “how to” guides as well as “case studies” and examples for the guests to learn from. There are a few different speaker formats, from a keynote speaker who opens the day with a motivating kickoff speech, to the main “arena” speaker sessions in the morning with 1 speaker to the audience for 20 to 30 minutes. Then we have panel discussions and breakout rooms throughout the two day conference. You can check 2016’s Cross Border Summit here and 2017’s Cross Border Summit herefor ideas and examples of speakers and the schedule format. Yet expect this year’s to be bigger and better than ever! Product development, sourcing, and manufacturing – the core of any product based business is in the actual physical good they are selling! Many are buying from China or South East Asia, and it is quite an overwhelming task. We always want to have speakers to cover topics on making the products, ensuring they are of good quality, and getting them to the final customer in a great format. Marketing and Sales – once you have a solid product to sell, you need to SELL it. Or, even better, you have sales before you have manufactured it. We’re always looking for exciting and fresh content from speakers on how to get more eyeballs on our products, crowdfunding, and expansion in the marketplace. This includes both Chinese social media and SEO as well as overseas. Marketplace Strategies – Amazon is the dominant player in the International market, we have had speakers and panels on Amazon and its always a hot topic. We also see new marketplaces in the horizon with Jet and Walmart coming up strong. Yet we also want to share strategies with Chinese marketplaces as well – such as Jing Dong, Tmall, and others. This is, after all, cross border and we want to cover marketplace strategies with both the International (Western) markets as well as into Mainland China. Expanding to More Markets – Southeast Asia, South America – While everyone always focuses on US market and China market, we want some fresh perspective on going to newer markets that many sellers have not yet tapped into. We’d love to have speakers who have experience in these markets to share and give strategies and case studies. Building Up Distribution – how to get more sellers on your products. Strategies and examples for people to find drop shippers, affiliates, resellers, wholesalers, and traditional brick and mortar. This is a wide open space and we would love to hear from you on some fresh perspectives on how e-commerce sellers can diversify. Banking and International Finance – When we get into cross border, and international, it gets quite complex. There is multiple currencies, multiple jurisdictions, taxes, governments, the list goes on and on. We always love to have some legal and accounting experts to share their concepts and point of views with our business executives and entrepreneurs. Staffing and Multi-cultural team management – To scale a company, you need people. And as cross border businesses by definition bridge across borders, you will need to deal with a whole host of different languages, cultures, and styles of work. How can a CEO deal with this complex and multi-faceted HR structure, and what have successful companies done to stay ahead of the pack. Immigration and Citizenship – On a more personal level, we love to discuss where a international and cross-border executive should base their business as well as themselves. How will taxes work? What are some factors a growing business executive should consider when deciding where to position themselves in the current and growing global economy. Founder Stories – Of course, we want to hear from business owners who took something and made it a massive success. If you want to share your business story, how it got started, how you scaled up operations, and willing to expose yourself to some of the weaknesses and setbacks you had to overcome, we’d love to hear your story! Virtual Reality and Other New concepts – As any business executive can imagine, we cannot get comfortable with the current marketplaces and marketing strategies. We need to keep our ears to the ground on growing technologies, and we want speakers here to share on new strategies sellers should be aware of. How can VR help sell more products? Should someone consider making a VR website and online shop? What other new concept technologies are budding out there that e-commerce sellers should be looking for? Are you a corporation that wants to get in front of these people but may not be able to speak or attend? We’d love to have you consider hosting a meetup, we will have various times in the day and in the evening for the audience to get together around a specific topic and engage. Let’s start planning now and have an interactive and fun session for your business’s brand and overarching industry. Have a topic or spin that we didn’t list above? We are all about new and creative ways to make this Cross Border Summit entertaining, educational, and memorable! If you’re a business who wants to get in front of our audience, or an attendee that wants to see something new and interesting – please don’t hesitate to contact us and let us know! Or, simply leave a comment below with your suggestion! Let’s make this year’s Cross Border Summit cover the most we can – and make business owners in this growing and complex industry reach their success targets together. Take Action. Be a Speaker! I can be a speaker on topics related to cross-border branding & digital marketing. See the speaker page on my website for more info. We received your request to be a speaker at the CBS 2018 – and are now looking at opening 1 or 2 more slots due to some schedule updates. To make this process easier – we have made a form – if you are still able and willing to be a speaker – please complete this form as soon as you can. I can be a speaker on topics related to cross-border ecommerce and selling online globally. Understand the requirements of various online cards and alternative payments with settlement support to boost your acceptance, conversion and revenue. Please see my organization homepage at http://www.safecharge.com to find out more. thanks you Jasper but we already have this topic covered, hope you can attend though!